Home » Simply Personal » Can You Tell I’m Really, Really, REALLY Looking Forward to Spring? We have had a LOT of big snowstorms this winter, and sometimes it has snowed continuously for several days… leaving us with a tremendous amount of snow. 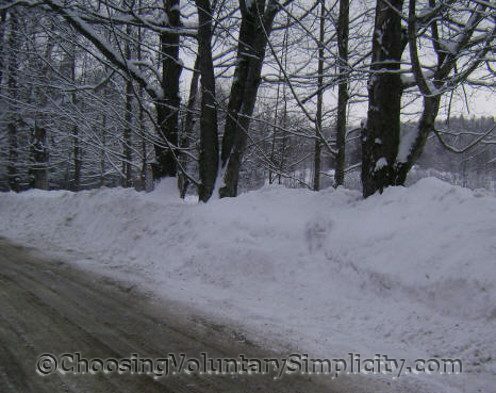 There is no such thing as snow removal here, and when the plows go through, the snow just gets pushed to the sides of the roads… and back into the just shoveled driveways. These photographs were taken several weeks ago when the snow banks were only about four-and-a-half feet high. Now, five or six snowfalls later, the snow banks are so high you can’t see over them, and the roads feel almost like tunnels. 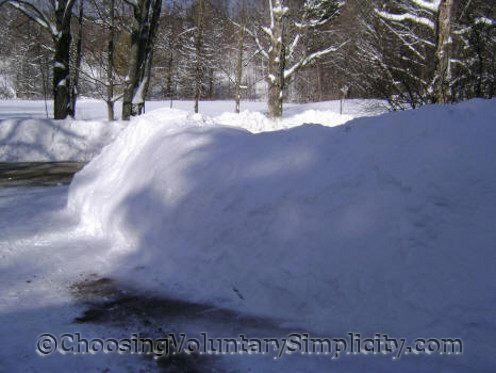 Shoveled paths are the same… there simply is no place left to put the snow except up! It has been cold here too, with supposedly record low temperatures for days at a time. The roads and paths are icy because the original layers of ice from the December ice storm never get a chance to melt. The road crew puts sand and salt on the roads… we put wood ashes on the paths… but they’re both still dangerously slippery. It is true that we have also had day after day of bright sunshine, and all that snow is beautiful against the background of a vivid blue sky. I need to keep remembering this because the snow and cold will be with us for at least another two months. I don’t ski, I don’t snowboard, I don’t snowmobile. So WHAT am I doing living in snow country? I wish I knew the answer but like you I’ve had enough of winter this year. I don’t like it either. Boy, I could really relate to this post! I have tried to “make friends” with the winter for many years now with little success. I have often looked outside after a fresh snowfall and tried to convince myself how beautiful it was. But what it boils down to is: I just don’t like winter (this winter was especially difficult as it has been an extremely frigid January). I can relate to the snow because I reside in MN and quite a bit of the white stuff falls during the winter months. If you dress warm enough and find an outdoor activity to enjoy the winter months it can be quite beautiful…especially in the woods on a cross country ski trail or snowshoeing. The most beautiful winters are when dense snow hangs on the trees in large clumps and really whitens up the place. We live in Georgia and we have snow here too. Not much snow but still too much in my opinion. Usually we have snow once in 5 or so years but it snowed here last year and again this year, twice actually. I can’t imagine having as much snow as you people have in New England. I do agree that it is beautiful but I think it ends there. At least for me it does. I really enjoy your blog and your beautiful photo’s. I can *SO* identify with this! We don’t have as much snow as you do but I am totally tired of winter and being cold. Another great post btw. Reminds me of the end of my Drive way here in the Niagara County. Bless you for putting up with the plows around your place. And a gas leak on my end Long day along with 5 neighbors without heat and hot water, need I day more???????? Thank you for making me realize in what I want to do in this world besides the frugal/cheap part to save nickles here for the long run. I live in Ms.and we get little snow.Two years ago we got a Big one.Loved it.